So, I just got my shipment notification email from Amazon. 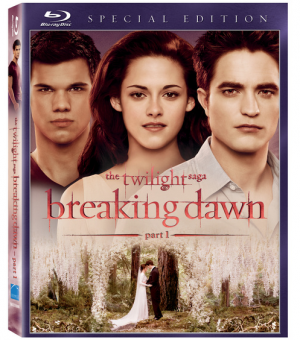 They have shipped my copy of Breaking Dawn: Part 1, but I will not receive it until February 13. Words cannot convey my disappointment in the fact that I won't be watching, in my opinion, the best Twilight movie to date, tomorrow. Amazon has failed me. FAILED ME!! I need to see that wedding again, stat! Well, I should be perfectly honest and say that I need to see that wedding and honeymoon again, stat! Now I need your advice, fellow Twilight fans. Should I wait it out until my copy arrives from Amazon on February 13---or (and this is what I really want to do) should I buy a copy tomorrow and return my Amazon copy when it belatedly comes in? I lose all ability to reason when it comes to Edward so I really need some guidance here! I'd go buy it. My aunt bought a book from amazon and it wound up being wrong and when she called (or emailed?) to return it they told her to keep the book and gave her a refund!!! Maybe that will happen!! I just might! I was in Target earlier and saw their display for the midnight release and got so mad that I won't be watching it at naptime tomorrow like I had planned!! It will give you something to look forward to next week. Hey is that a new blog button? It's super cute but it doesn't ring a bell with me. I'm off to add it to my blog.